Many of DAI’s members were in Chicago this year for ADI’s longest running international Conference on dementia. We are proud of all of our members who presented at the conference, whether as invited Plenary speakers, as part of DAI’s panel session or in the concurrent sessions. Everyone did a truly amazing job. Or, like one of DAI’s co founders, John Sandblom, who presented in the Opening Ceremony! Our blog today is of Johns speech, and we thank him for representing us all so very well. Johns speech notes are available to read below, although he did also ad lib quite a lot! Slide one: Thanks to ADI for the invitation to be part of the opening ceremony for their 33rdInternational conference, and for sponsoring our stand in the Exhibition Hall. Thanks also to Alzheimer’s America for co-hosting the event. When I first met Mr Harry Johns, the CEO of Alzheimer’s America, he said, please just call me Harry! My sincere thanks of behalf of DAI to the Alzheimer’s Association of America for co hosting this event, and thanks also to the LEAD coalition for their sponsorship supporting our members to attend. Special thanks also to DAI members for their hard work in fundraising for us all to be able to attend this event. As one of eight co founders of DAI, I am honoured to represent our members today, and to have been invited to speak. DAI is an organisation which now focuses on many things, but our primary focus is on improving the quality of life for people with dementia and their families, and advocating for them globally for the realisatin of our human rights. Slide two: This slide is one of DAI’s graphics, and is a global overview of dementia – based on data from ADI’s World Alzheimer’s Report in 2015, and the data on the WHO website this year. Slide three: Dementia Alliance International is the global voice of dementia, and is a registered non-profit organisation whose membership is exclusively for people with a confirmed diagnosis of any type of a dementia, whose membership is now represented in 47 countries. We seek to represent, support, and educate others living with the disease, and the wider dementia community. DAI is an organization that strives to provide a unified voice of strength, advocacy and support in the fight for individual autonomy, full and equal inclusion and improved quality of life, empowering people to live with dementia, not only die from it. DAI has been in a strategic partnership with ADI since 2015, and we thank them for their ongoing support. Slide four: The power of what DAI does is enormous and it helps improve the quality of life for our members. Slide five: DAI is very proud to it’s YouTube channel was listed in the top 20 dementia channels in2018. Slide six: DAI has made their global focus about campaigning for human rights and access to the CRPD at organisations such as the United Nations, Convention of the State Parties on the Convention of the Rights of Persons with Disabilities and the World Health Organisation. Our mission is to empower people with dementia to live more positively with dementia, and to demand quality health care and disability rights. To fulfil this mission, we work with governments, other organisations and individual members of civil society to create change in programs, practices and policies that affect people with dementia and their families, now and into the future. It is imperative there is NOTHING ABOUT US WITHOUT UT, and this is our undisputed HUMAN RIGHT. Slide seven: DAI wishes everyone a successful and enjoyable conference. This week DAI features a story of one of our younger members, 33 year old Kris McElroy. As an organisation, we love supporting him, and really enjoy his company in our support groups and online meetings and cafes. Some of us with younger adult children also find it a little confronting, as we cannot imagine how we would feel if it was one of our own adult children. This must also be how older parents feel of their adult children, diagnosed in their 40’s and 50’s. Thanks to DAI board member and co-founder of ODAG, Phyllis for supporing Kris to share his story with us all. He is being profuled for the Glboal Disability Summit in London soon as well. We lovingly call him ‘Smiley’, as he has a truly radiant smile, and is a joy to be around. Thanks Kris, from everyone at DAI for sharing your deeply personal story. These days it’s easier for me to remember my birthday than my actual age. October 31, 1984. My cognitive abilities have changed. Numbers get to me the most. I can state a date or the time, but I struggle with it’s meaning especially in relationship to other things such as a how much time I have to get somewhere or return a form. Even when I am trying my best and I think I got it, but yet somehow I frequently seem to miss something and I just can’t figure out what it is. People these days see me walking with my walker, then here me speak and it is assumed I am more likely to have a caregiver next to me than a friend; that I was born this way and am fortunate if I graduated high school; and that I can’t answer my own questions. I know the look and awkwardinteraction all to well of people not knowing how to interact with me. It’s not like I haven’t spent my entire life trying to get people to see my abilities not my disabilities. I was born with a progressive neuromuscular disorder – still the exact type and cause unknown. It effected me in a way that was visible every time I spoke and moved. It is still amazing to me how stigma; stereotypes; and discrimination mixed with lack of awareness, knowledge, understanding, inclusion, and accessibility impact one’s self image and quality of life. For the longest time I thought for me to be visible, to have a chance, to be seen as human; I had to do my best to be as “normal” as possible. Since, I couldn’t hide my disabilities on the outside, my mind was my gift. My mainframesuper computer that could keep track of everything, my coping mechanism, and also became my hope for the future. Once I had a PhD, someone like me could make it in this world. A PhD would make my disabilities disappear and allow people to actually see my abilities first. It was always on my radar that I won’t have a voice until I earn my PhD. Either a PhD or find a cure for my disabilities. Never once was dementia on my radar. Never once did I think I my mind would change how it is able to function within the world around me. Why would it be, everywhere I looked it was described as the stereotypical old persons disease. I had defeated so many odds and I earned B.S in Psychology, a M.S in Multidisciplinary Human Services. I was in my second year of my Ph.D with a 3.8 average. I had challenges all my life, but I always bounced back or found a way. Until the challenges started becoming more noticeable and it took longer navigate things that were once quick and easy. I showed signs of what was called “mild to moderate neurocognitivedisorder” in 2015. I don’t remember how old I was, but I still have the report from the testing. Yet, as with most things, the doctor explainsthe results, gives a copy, and then you are sent on the way to continue life. So, I did. I was used to this. What I wasn’t used to was the changes I experienced in spelling, ability to edit, ability to comprehend things, keep track of things, navigating, and the level of confusion. They said I was just young, it was just stress, and with rest it would go away. My whole world was changing, and the challenges were increasing. I didn’t know what was happening to me, it was frightening, and it was effecting my functioning. So, my neurologist referred me to testing again. I remember my sister talking about her concerns and mentioning sundowners to the neuropsychologistdoing testing again last summer, the doctor laughing, and then the doctor’s apology and deep concern when she shared and explained the resultsin June 2017, the results that the test results show I have dementia. Since then, it has been a struggle to get people to believe the diagnosis or to know how to help, and how to find my way – a new way of life.When trying to get services it felt like I had to give up my quality of life in order to have help. That was a very stressful and frustrating process. The only other option given was to go into an assisted living. My sister has been the one person there constantly through it all and it has taken a toll on her too. We both just wish there were more resources, options, services, support. Her unconditional love and support a bright light in my everyday new world. It’s coming up on a year since the diagnosis of dementia. 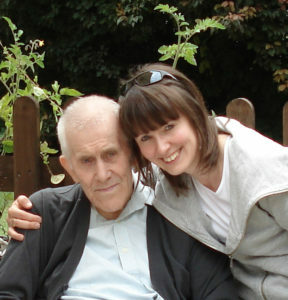 It is still not clear which type of dementia it is or if it is separated or connected to my other medical conditions. Life looks very different from what it used to. People have come and gone, new faces have brought a sense of joy and hope never imagined at the time of being diagnosed. It was hard to know what to do, what to feel, how to move forward. I spent a lot of time trying to “keep up with the joneses”, but each time that made my symptomsworse. So, I traded in pursuit of my PhD for discovering new ways to help others, engage in my community, explore my talents and share my gifts.Alongthe way it became about just finding a way each day to take it step by step and live well each day whatever that may look like at any moment within any day. Quality of life, according to what that means to me. So, I have adjusted and adapted many things, and as challenges arise or shift, adjusting and adapting occurs time and time again. Still as with other medical conditions and other things across my life, dementia is a part of my story, but it is not all of my story. It is a part of who I am, but it is not all of who I am. My age does not determine whether I have dementia. 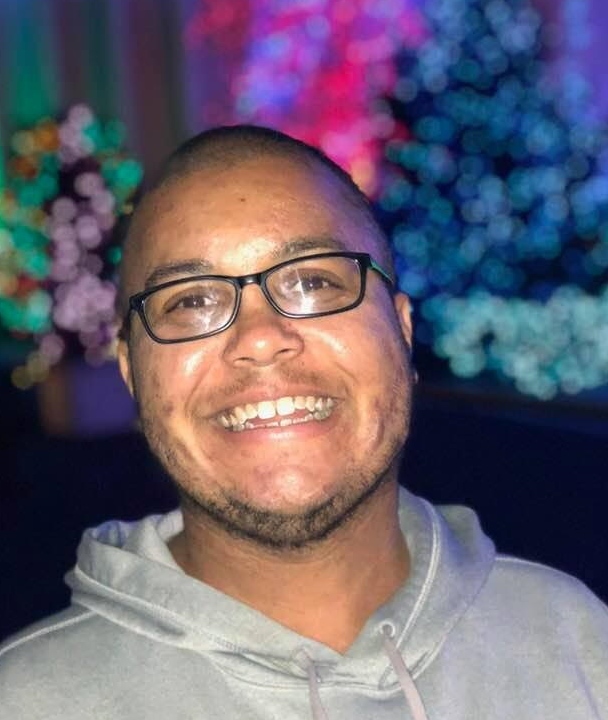 My age just means at this point on my life journey, I am a 33 year old chef, artist, writer, volunteer, educator, Special Olympian and athlete, with dementia and other health conditions who has good days and bad days determined to live life well and each moment to the fullest. Kate Swaffer gives her keynote presentation at the WHO Ministerial Conference on Global Action Against Dementia, Geneva. Tuesday 17 March 2015. Photo by Violaine Martin. 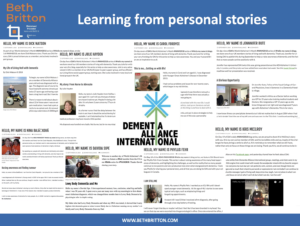 Dementia Alliance International is the peak body for, and the global voice of people with dementia, with members from 47 countries, starting with only eight co-founders in 2014 from three countries. As we head into next week, where as Chair & CEO I am again representing DAI at the World Health Organisations Seventy First World Health Assembly, it is useful to be reminded of where DAI started, and the impact DAI has had, and continues to have on its members and on the world. The World Health Organization (WHO) is a specialized agency of the United Nations concerned with international public health, and is a member of the United Nations Development Group. Whilst others spoke or wrote about human rights for people with dementia before March 2015, it was in Geneva in March 2015 when as DAI’s then Co-Chair, and as an invited speaker, I gave a keynote speech on Day 2 of the WHO First Minsiterial Conference on Dementia. It included human rights and the CRPD in my three demands, and this seems to have had a snowball effect of ensuring the whole global dementia community has moved further away from rhetoric to more tangible action. Action is important, especially as the United Kingdom has rebranded their Dementia Awareness Week to Dementia Action Week this coming week. 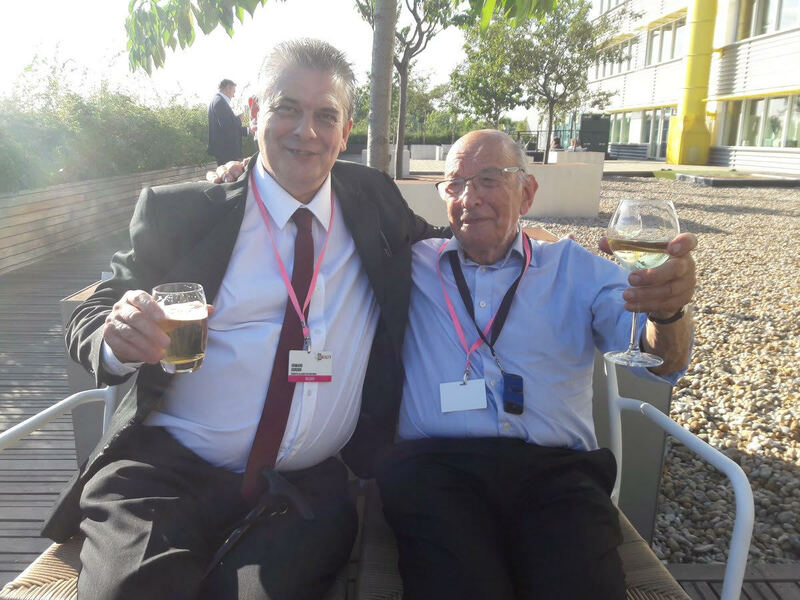 The eight co founders of DAI had high aspirations; they wanted to advocate for, but more especially to empower others with dementia to become self advocates, and to live more positively in spite of dementia, not only advocate for themselves. 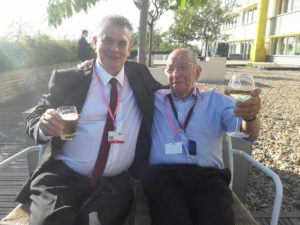 Thankfully, many more people are active as advocates today, than when DAI started, and often we are told it is because of having been a member of DAI, and finding out there is still a good life to be lived, alongside of, or even in spite of dementia. It is a different life than the one we imagined before dmentia, but it is still possible to live positively and contribute in meaningful ways to society. That is, in fact, our basic human right. Through her involvement with DAI activities, such as being funded in 2016 to represent DAI at two events, one in New York where she read out a three minute DAI statement, and the other the Social Forum in Geneva, both funded by DAI to represent us all. She was also funded by DAI to attend two International conferences (ADI Budapest and Alzeimer’s New Zealand), she has found a renewed purpose. It was initially through attending DAI’s weekly online support groups, and a lot of one to one mentoring and support that Mary became so actively involved with living again. She has since moved on to other missions and organisations, but it is exhilerating to see her, and so many others living positive and active lives again. Many, like Mary, have been ‘kickstarted’ to reclaim living their own lives again, albeit often with new directions and purpose since their diagnosis of dementia, but largely due to joining DAI. Our peer to peer support groups are very powerful in healing, in helping us make sense of dementia. Finding support from other like minded people, facing the same disaease or situation is empowering. 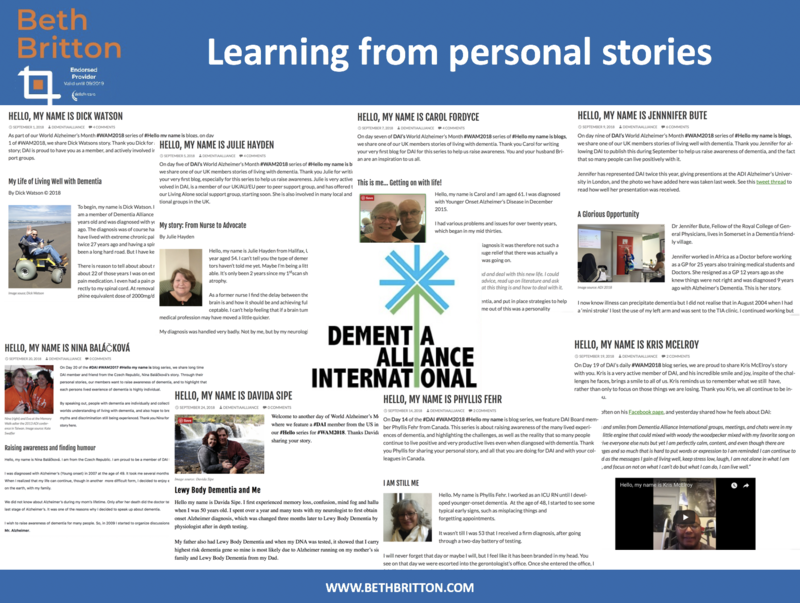 I hope that your readership will benefit in many ways, since we wish to share the knowledge we gained from participating in the UN Social Forum as representatives of Dementia Alliance International. This was an unprecedented (and exciting!) opportunity to be part of a global attempt to improve the lives of people with dementia. Such is the impact of DAI; empowering others to reclaim their own lives. Most of all, DAI teaches others that they can ‘live with dementia, and do not need to just go home and wait to die from it’, as so many are still being advised to do. We may not all stay in close contact forever after getting to know each other through DAI, but that is human nature. DAI is proud of where it started, and what it has achieved in the last four years and almost five months, but we are also often exhausted. As an organisation, we have made a significant impact globally for a human rights based approach to dementia that includes disability rights, including rehabilitation, and for recognition and full access to the CRPD, CBR and SDG’s. Our current 2018 board and Action Group is hard at work, making an incredible commitment to all of our members and the global dementia community, and I thank them all, on everyone’s behalf. I’m planning to publish a daily blog throughout the Seventy First World health Assembly this week, to keep you all up to date. For new DAI members or supporters, we highlight the DAI sevices and activities below. DAI is run by people with dementia, for people with dementia, with very limited funds, operating from an annual budget of less than $50,000 per annum, and still without any paid staff. 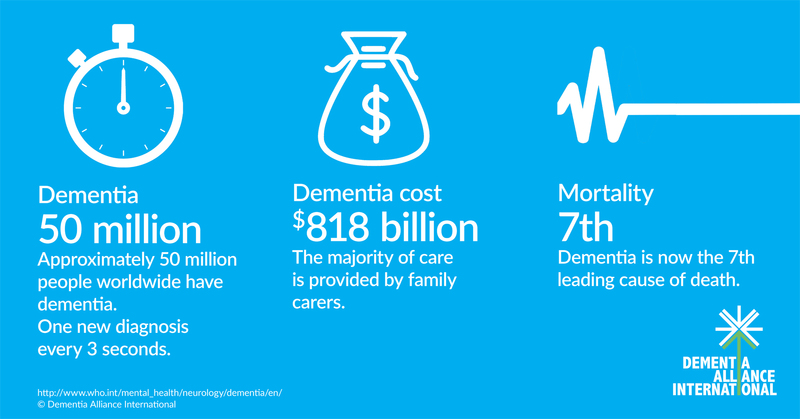 There is no doubt there is an enormous economic cost to dementia, not only to the person diagnosed, but also to their care partners, families and support persons (if they are lucky enough to have any), and to the health care sector and our governments. Our latest graphic clearly highlights this, and is based on data from the World Health Organisation (WHO) website published last year. Apart from the economic cost of dementia, there is a significant human cost to this disease, and you can find many blogs, published journal articles, media stories (print and digital) and books on this, written by professionals, academics, care partners and yes, even many people with dementia. Too often, the person is not seen, and only the symptoms are. Our deficits are focused on, and we don’t receive appropriate disability support nor recognition for the assets we have retained. These are often completely ignored. It is why we also campaign globally for our human rights for better support and services. We must also be supported to live more positively with dementia, from the time of diagnosis. One of DAI’s goal is to empower other people with dementia to live more positively with it, and as such, try and reduce some of the human cost of dementia. 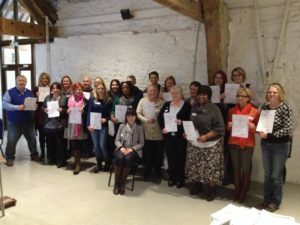 In doing this, we promote engagement, peer-to-peer support and participation at events and educational webinars, albeit mostly online, for our members and also for the wider dementia community. Most of our members, when they first join DAI have been advised to get their end of life affairs in order, and often, even to choose a respite day care centre and nursing home. When that happens, most people (and our families) spiral into a dark and depressing place, and become fearful and afraid of what lies ahead. “Will you take the time to read this to the end? It’s is not about me and never will be…. I wake up every day praying, that what I managed to do yesterday might make a difference in the “lived experience” for the “people” being diagnosed with dementia today and tomorrow. Unfortunately, “people”, society and governments seem callous and unwilling to support simple, cost effective improvements to our “lived experience”. They prefer spending Billions upon Billions every year on finding a magic cure, whilst the largest pharmaceutical companies in the world have abandoned research due to their failure to get positive results. In the meantime, nearly nothing beyond lip service is being done or invested in what actually helps us that are diagnosed. The result is Needless & Unnecessary suffering for countless millions of “people”. Dementia Alliance International “goes beyond lip service” and is changing “peoples” lived experience every single day but, nobody seems to want to help us financially. I guess it’s because we all have Dementia? I imagine nearly every person who took the time to read this post can afford to donate “$10.00 A MONTH” so we can reach and offer weekly peer to peer support to the 10,500,000 million “people” diagnosed every year. 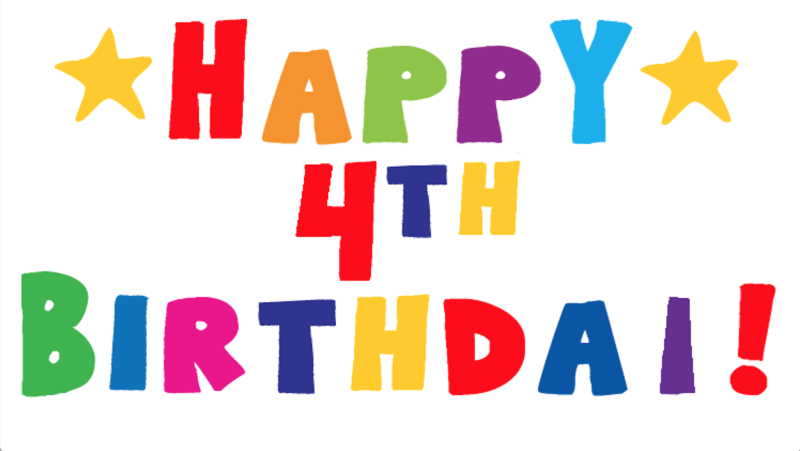 On January 1, 2018, we at Dementia Alliance International celebreated our fourth birthday. We have definitely come a long way following the aspirations of our founders, and although we have achieved quite a lot, DAI still has much work to do. We welcome you to join us in any or all of our work, and can be contacted here. Dementia Alliance International (DAI) is the world’s leading organisation exclusively for people diagnosed with any type if deMEntia[i]. It is an advocacy and support group of, by and for people with deMEntia. We are “the global voice of dementia,”, currently representing 44 countries. DAI is a 501c3 registered charity in the USA. DAI’s vision[ii] is “A world where people with deMEntia are valued and included”. 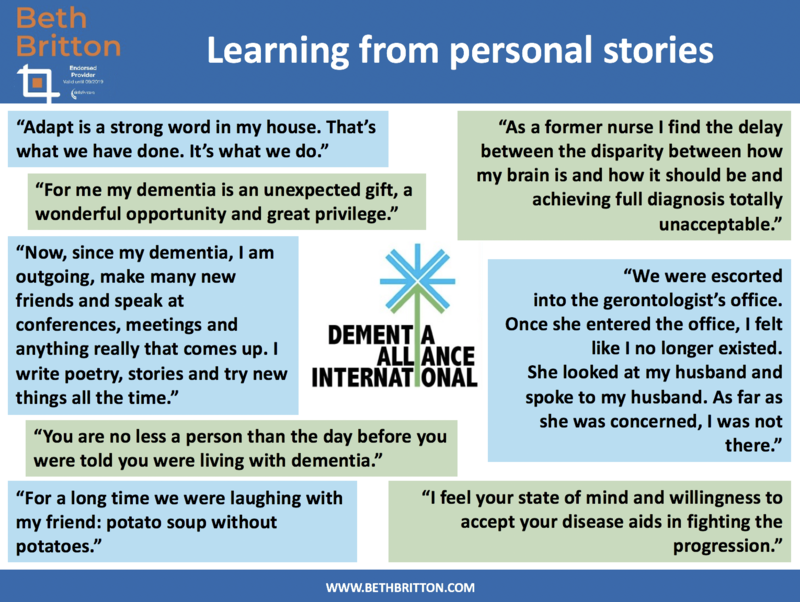 DAI started instinctively, after many years of discussions with organizations and then others diagnosed with deMEntia, for the purpose of self-advocacy. When our founding members[iii] were each diagnosed with dementia, they individually experienced “the degenerating sense of ‘nobodiness’”[iv] that civil rights leader, Martin Luther King, Jr. had already recognized in another disenfranchised group, the mid-20th century African-Americans. Collectively, we at DAI realised we had to struggle with multiple challenges: not only medical, but also many based on social stigma and discrimination, related to changes to our cognitive ability. 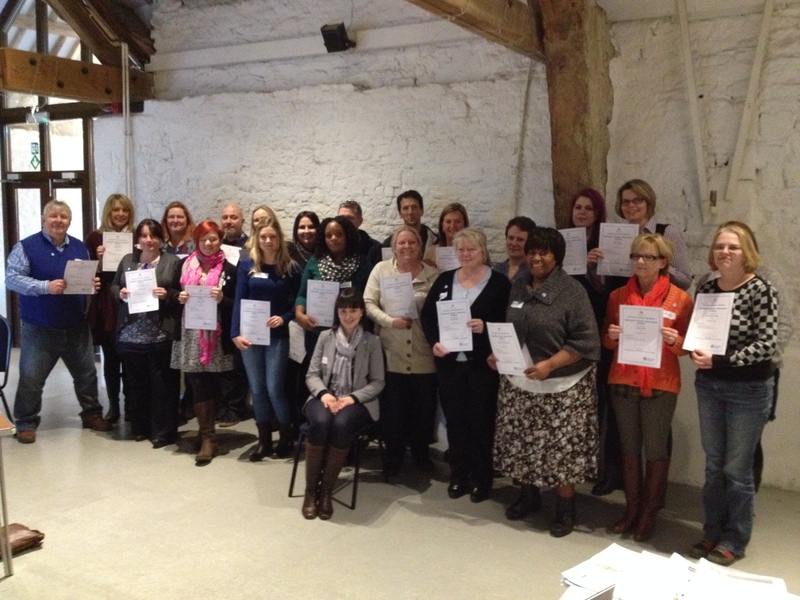 So we began to articulate the unfair, hurtful, de-humanising injustices imposed upon people with deMEntia. The task of speaking out against people causing us harm is complicated (and sometimes precluded) by the fact that many of them are well-intentioned medical staff, service providers, advocacy organisation and close friends or family who are also often our care partners[v], but who may be ignorant, unwilling or unable to take the time to find out our wishes and needs. Although we are grateful for the support of family and friends, we have sometimes been demonized for needing them. We have also been demonized for not needing them, and for daring to live positively with deMEntia. People with deMEntia historically are written about as if we “suffer” from it, and are labelled a “burden” to society and have been labelled with all manner of other disrespectful terms. We ask others to use respectful language[vi][vii] when talking to us, or when or writing about us. We at DAI therefore believe it is imperative to change misperceptions about dementia, address stigmas associated with it, discourage the detrimental psychological and physical abuse of people with any disAbility[ix], and demand that the voices of people with dementia be included in decisions directly affecting us. The misguided under-estimations of our potential continue to create oppressive and humiliating barriers to our full engagement in society. Some of us have even been publicly accused of being imposters, on the grounds that no one with dementia could address an audience of professionals at an academic or medical conference, or live positive and productive lives. Perhaps the worst myth we experience is that others expect that people with deMEntia will go from diagnosis immediately to end stage dementia. This myth is endemic. Hence we have begun to individually and collectively advocate and educate more enthusiastically, locally, nationally and internationally, at professional conferences, and in the vast online communities we have built. We are dedicated to empowering all people live a better life with dementia, and not just to die from it. We advocate for our rights of equal and full inclusion in public spaces and activities; we educate the public on our human-ness in the face of cognitive disAbilities, so that we are not reduced in legal or social status. We seek to live well (just as all people do – that’s the point), to be valued for who we still are, and to be included as equal citizens. 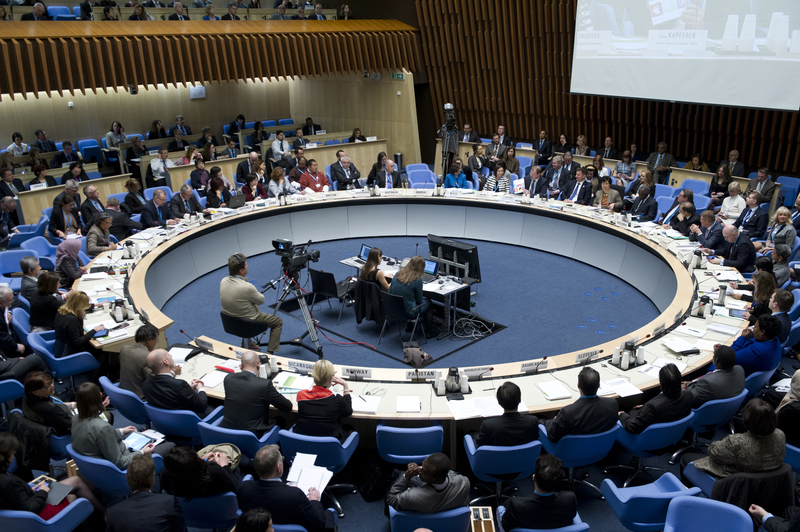 Our global focus has been on human rights and disAbility rights, and we continue to work with organisations such as the World Health Organisation (WHO), the United Nations, the Conventions Of State Parties and others, to ensure that since the WHO Global action plan on the public health response to dementia 2017 – 2025[x] was adopted, national, regional or local dementia plans will include human rights. This is why we continue to advocate at the grass roots level, and have become activists in the global space, for better care, to ensure deMEntia no longer receives the worst care of any disease in the developed world, or indeed, anywhere in the world. [iii] Founding members: Kate Swaffer, the late Richard Taylor, Amy Shives, Susan Stephen, the late Dena Dotson, Steve Ponath and Janet (Pitts) Ford. [viii] The Organisation for Economic Cooperation and Development’s published report of the world’s 38 richest countries (OECD, 2015, Addressing Dementia: The OECD Health Policy Studies, OECD Publishing House, Paris). [ix] We spell disAbility like this, to highlight the Abilities people with dementia or other disAbilities we retain.